FAMILY-owned whisky company Douglas Laing & Co has revealed a new look for its Premium Barrel range of single cask single malt Scotch whiskies alongside the launch of four new bottlings. The new expressions – Craigellachie 10 year old, Glen Garioch 8 year old, Bunnahabhain 10 year old, and a 100% sherry matured Dailuaine 10 year old – are bottled at 46% ABV and feature the new-look design. 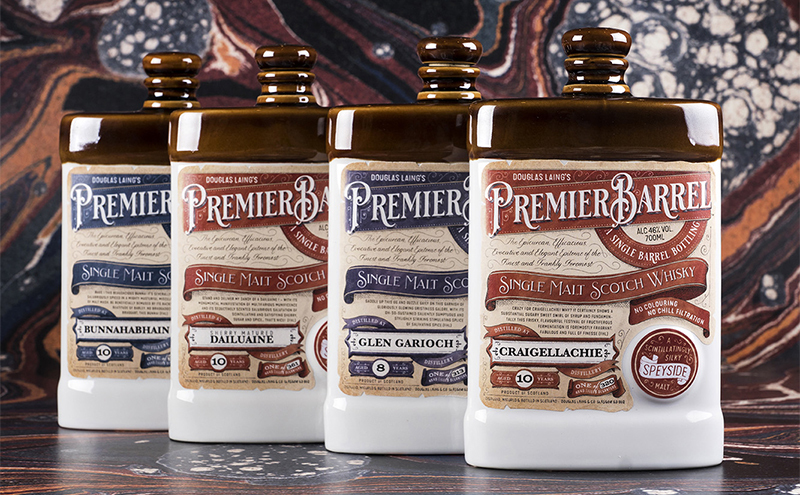 The refreshed Premier Barrel branding, which utilises regional colour differentiation and sees the original ceramic decanter don a new hand-drawn label on parchment paper, “aims to modernise Premier Barrel whilst honouring its traditional and artisanal charm”, according to Douglas Laing & Co.